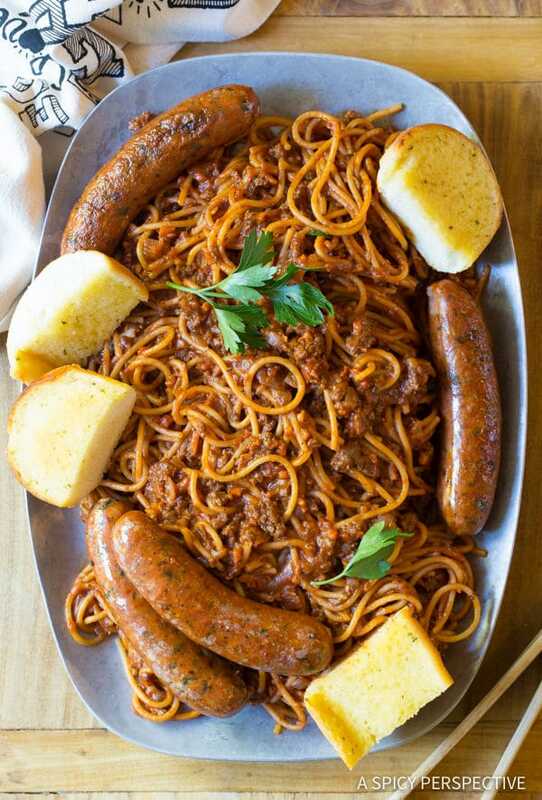 Amazing One-Pot Sunday Gravy made from scratch in less than an hour, served with crisp New York Bakery® Bake&Break™ Garlic Bread. Grandma’s going to roll in her grave! It makes me sad when family traditions are lost over time. Life is busy. With work, kids, after school activities, we struggle to put meals on the table and get enough sleep at night. Yet so many of the things families used to do, made a huge impact on their quality of life. It would do us good to bring some of these traditions back… Like Sunday Supper. Remember when mom used to put a beef roast in the oven with onions, potatoes, and carrots before church on Sunday? Families would come home to a house filled with the tantalizing aroma of roasted meat, then sit down together to enjoy a comforting meal and each other’s company. Or maybe you grew up with Hungarian heritage and ate Chicken Paprikas on Sundays. Or in an Italian family eating Sunday Gravy. 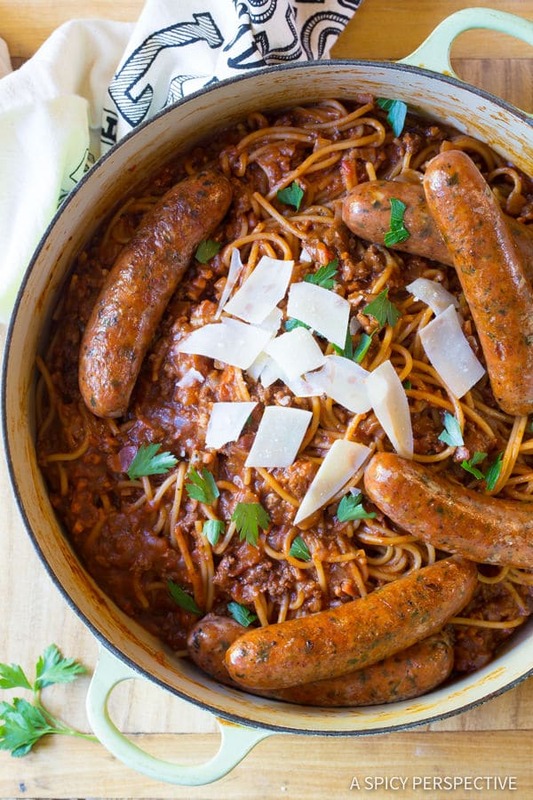 You may not have grown up with any specific heritage, but the art of the Sunday family meal is worth reviving, and today’s One-Pot Sunday Gravy is just the thing to do it! One, it usually took all day to prepare. Two, cooks would use leftover meat from their week of cooking in the Sunday Gravy to reduce waste. Three, it was prepared for a day the whole family could come together. However, Sunday Gravy can contain any variety of meats or vegetables, in effort to use leftovers and stretch the sauce. 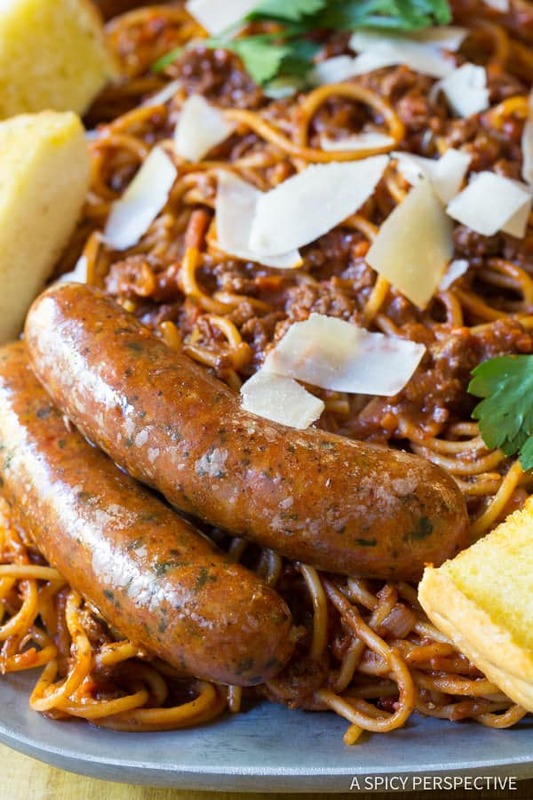 It is often served with sausage links, meatballs, and/or bell peppers. Our One-Pot Sunday Gravy recipe is a bit of an enigma, because it can be made from start to finish in less than an hour. It’s prepared entirely in one pot to keep clean up at a minimum. Plus, this One-Pot Sunday Gravy can feed a large group of people, and it tastes utterly divine. 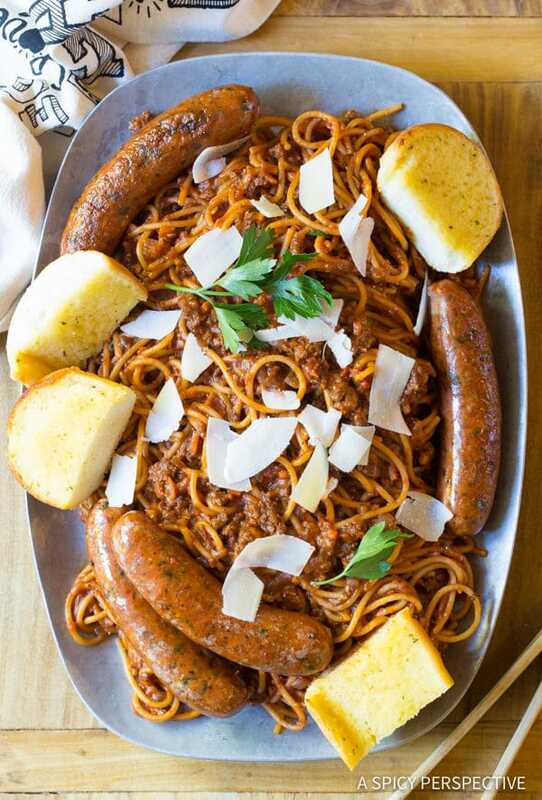 With a deep rich meaty sauce and sizzling Italian sausages, it’s just like grandma used to make. That means you can bring back the tradition of family dinner any day of the week. Something else that makes family dinners even easier is New York Bakery® Bake&Break™ Garlic Bread. 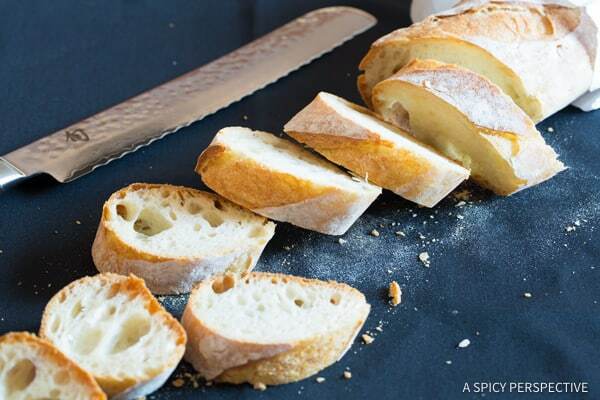 This freezer-to-table garlic bread is a fabulous go-to item to keep in the freezer. 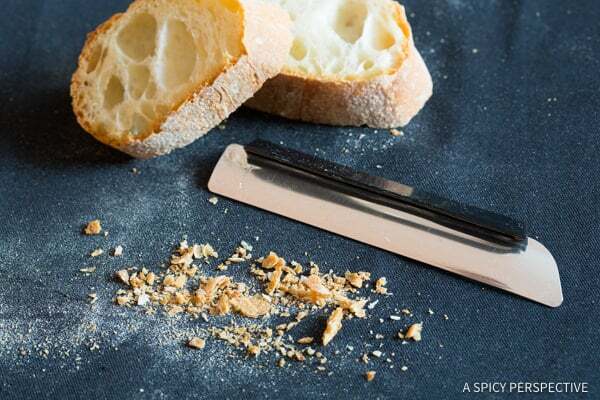 It can be baked in 5 minutes and makes no mess when you break the pieces apart! 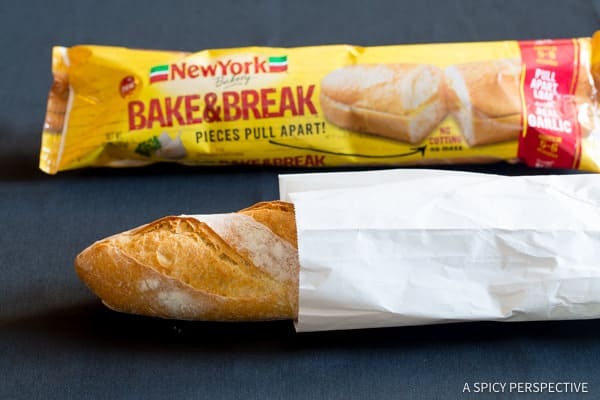 In fact, New York Bakery® encouraged me to take the Bake&Break™ Challenge… I laid a black tablecloth out and cut a standard baguette into pieces over it. See the huge mess I made? 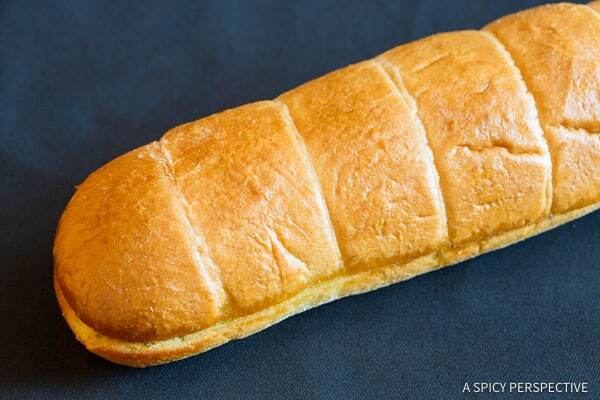 Then I baked the New York Bakery® Bake&Break™ Garlic Bread and broke it over the black cloth. Notice the difference? Almost zero crumbs. 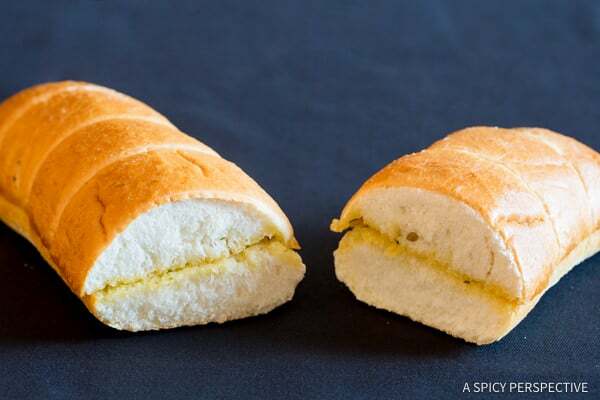 The garlic bread is crusty on the outside, soft in the middle, and dripping with garlic butter. What’s not to love? New York Bakery® Bake&Break™ Garlic Bread goes perfectly with my One-Pot Sunday Gravy, making this a quick memorable meal to bring the family together on Sunday… Or any day of the week! 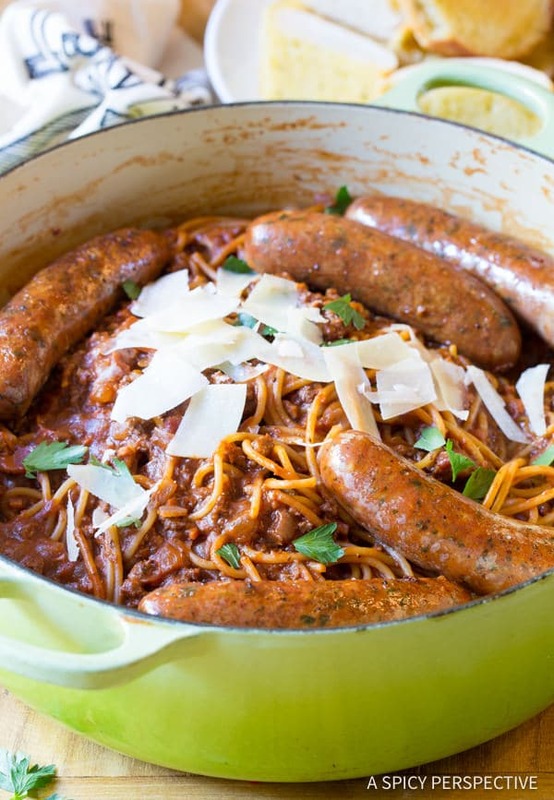 Comforting One-Pot Sunday Gravy Recipe. 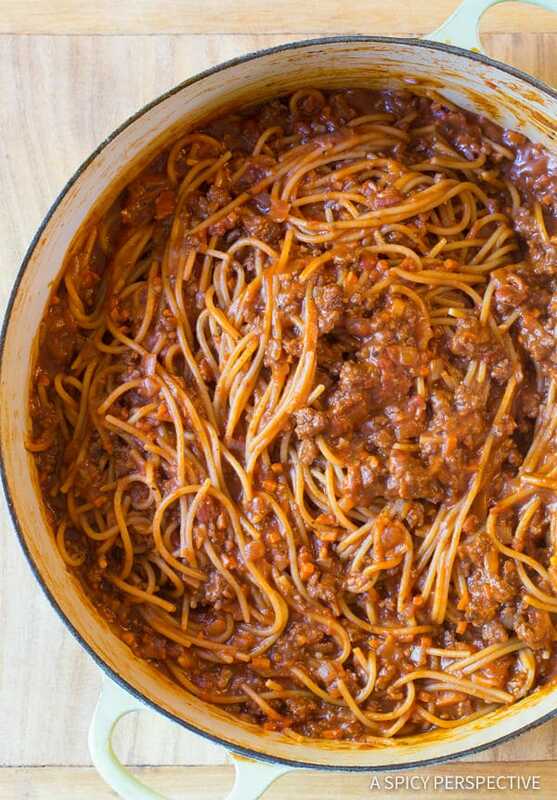 It's quick and easy to make, requires less clean up, and tastes like grandma used to make! 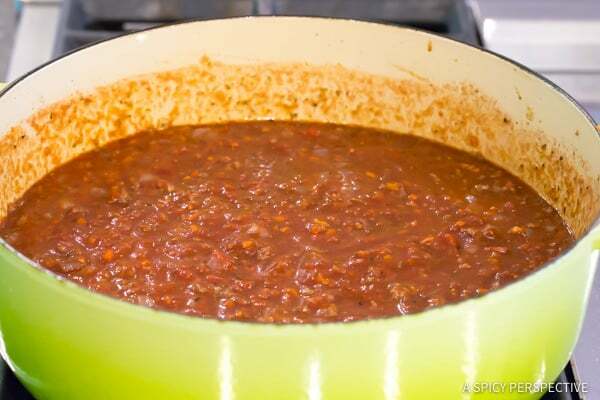 Place a large 8-quart dutch oven over medium heat. Add the diced bacon and cook until brown. 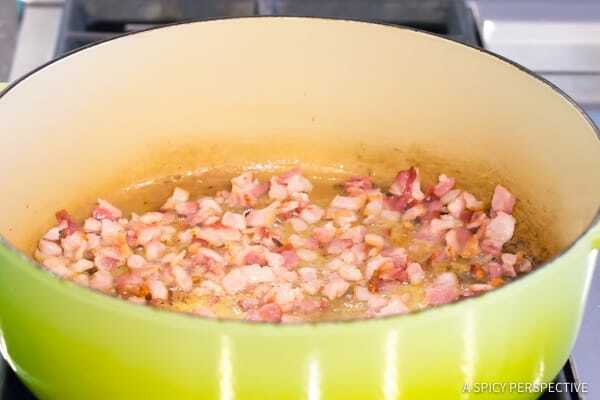 Remove the bacon with a slotted spoon and reserve for later. Add the sausages to the bacon grease and brown on all sides. 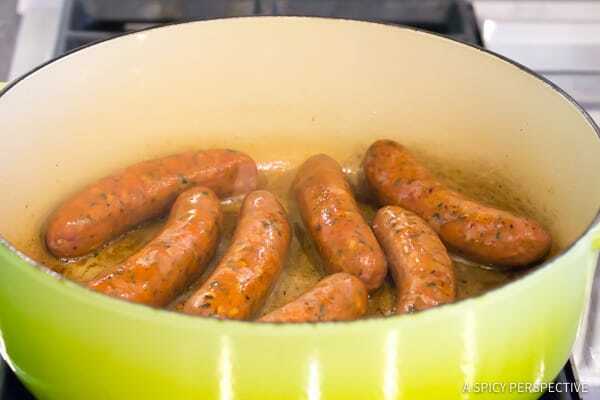 (If the sausages are raw, cook for 10-12 minutes.) Remove the sausages and reserve for later. 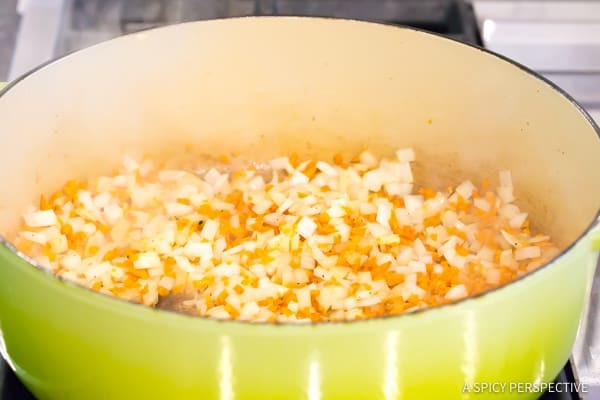 Add the onions, carrots, and garlic to the dutch oven. Saute for 3-5 minutes to soften, then add the ground beef and cook until brown. 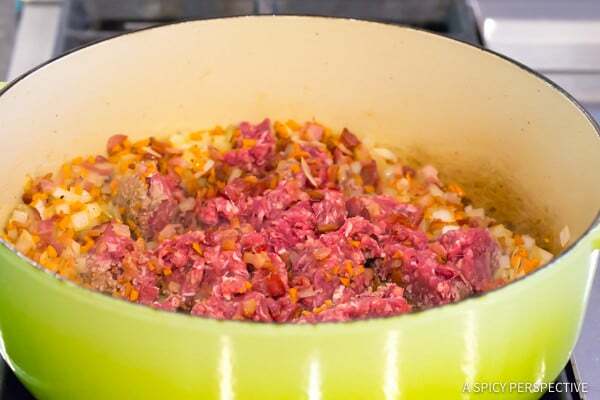 Use a wooden spoon to break the ground beef into small pieces while cooking. Spoon the bacon back into the pot. Add both cans of tomatoes, red wine, water, Italian seasoning, Worcestershire sauce, 1 teaspoon salt, and 1/2 teaspoon ground black pepper. Stir well and bring to a boil. 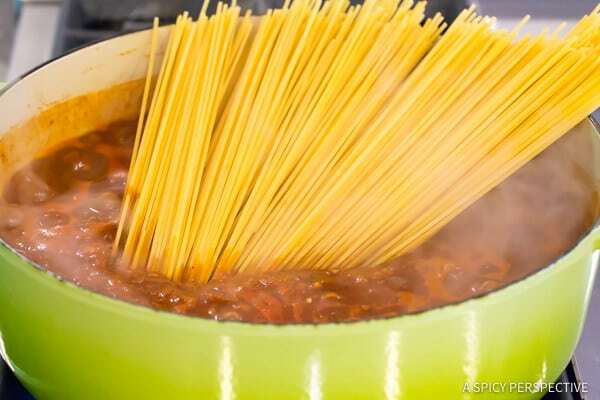 Once boiling, stir in the dried spaghetti. Stir well so the sauce separates the strands of pasta, and the meat doesn't stick to the bottom. Cover the pot and boil one minute. Stir well again to keep the pasta from sticking together and the meat from burning on the bottom. Do this 4-5 times until the pasta is cooked to Remove from heat and serve with sausages and New York Bakery® Bake&Break™ Garlic Bread. Garnish with Parmesan cheese and parsley if desired. NOTE: The fastest way to finely dice carrots is to buy shredded carrots and chop them into smaller pieces. This is a sponsored conversation written by me on behalf of New York Bakery. The opinions and text are all mine.